Life, Laughter and Paris: Relaxing Week Off? Uh, No! Relaxing Week Off? Uh, No! This week I decided to take some vacation days to have a bit of a rest. You know, sleep in, catch up on some reading, do my nails, just give myself a break. Good idea, no? No! 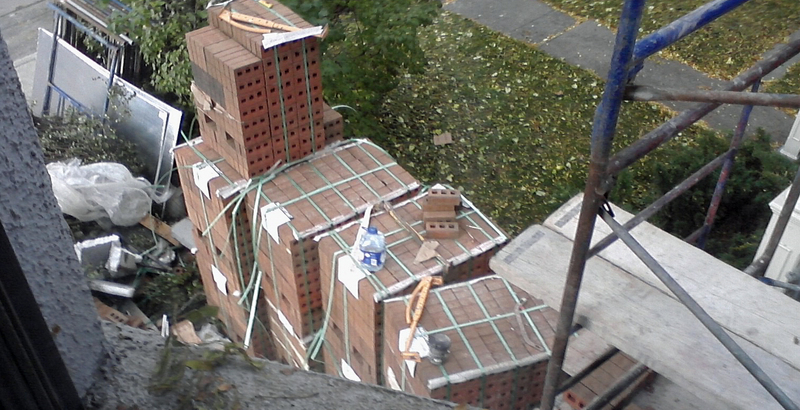 This week, our landlord decided to have the bricks REMOVED from our house to have new ones put on. View from our window. How relaxing! BOOOM! WHIRRRRR! CRASH! BANG BANG BANG! This time off was totally a bad idea. I would have been more relaxed at the office where it's busy but pretty consistently quiet. We've never owned, we've always rented, so this sort of thing is kind of foreign to me. Imagine pulling off ALL the bricks on the WHOLE house which, incidentally, has left the lawn a big pile of muck. Can that be right? fence. I hope this isn't the new urban chic! I really have to watch some home renovation shows. I love the decorating shows and know how to arrange furniture, nice lighting, airy spaces and all that, but bashing the bricks off? Wow. Maybe if I understood the how and why, the noise wouldn't bother me so much. Hopefully construction workers take the weekend off. They do don't they? Tell me it's true......our lease isn't up until next spring! PS: None of this seemed to bother Buster, our cat, who apparently can sleep though anything! I am a little stunned he decided to do this?!?! Like WOT?! Just wow. And may I suggest a psychiatric test for your landlord? Just a thought. And a very good thought indeed! I have never seen anything like that before, very strange.